In the same way that making automobiles smartphone-compatible has proven to be vastly superior (and more cost-effective) than reinventing smartphone functionality and building it into every car’s dashboard, the television set paradigm has just shifted. Why pay extra for expensive technology built into your screen when you can bring your own bell and whistle to any screen you want? That’s exactly what Google is saying with Chromecast. While an arms race among television makers has been mustering over the development of “smart TV” that lets people use the Internet on the biggest screen in the house, Chromecast is like Dropbox for TV. Everywhere you go, you can have your stuff, on any screen, doesn’t matter if it’s “smart”, dumb, big, or small. And you can use your frigging phone or mouse instead of a remote. I think it’s one of the smartest moves the company has made in some time. via Like Dropbox For TV, Chromecast Changes The Game | LinkedIn. 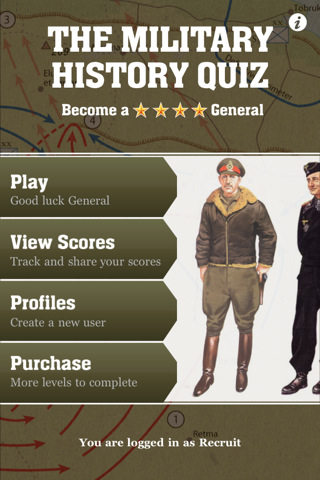 I downloaded the free version of Osprey’s The Military History Quiz App last week and I just wanted to give it a quick word of praise*. Simply put, it’s excellent. It combines some excellent design with great questions and a very clever in-App purchase set of options. First the design which is smooth and consistent and looks good throughout the app. It has a sufficiently martial theme to keep the military-history nerd in me happy. The questions are tough enough, even in the free section, to challenge both the novice and the knowledgeable history buff. As they progress though they sure do get harder! And it’s that progression that makes the in-App buying options so smart. For only €0.79 you can upgrade the levels to reach 1 Star General status. After that it’s €2.39 a level OR you can choose to pay €5.99 for every level in one go (the levels go to 4 Star General) including the first one. I have to admit, the App punctured many of my illusions about my knowledge base when it comes to military history, but I guess that’s a small downside when you learn so much along the way! It’s a fine piece of work, it works smoothly and I hope it generates huge sales for Osprey who have a real can-do, will-do, try-anything spirit that’s hard not to admire in the modern publishing environment. I’m sure they are working on the Sci-Fi & Fantasy version of the quiz too (Osprey also owns Angry Robot, a relatively new Sci-Fi & Fantasy imprint). *It’s probably fair to note that I know one or two of the folks that work at Osprey well enough to have a chat at the odd Book Fair or over Twitter, but I’ve never worked for the company. I’ve written about them before a few times though. Bloomsbury has featured on these pages a number of times. To my mind, too much of the focus on Bloomsbury is about Potter and Rowling. When I’ve been interested in Bloomsbury it is generally for their clever acquisitions and what I perceive as a well developed but poorly reported strategy for acquiring valuable and sustainable brands that have digital potential. The announcement yesterday that Wisden their cricket imprint (which is part of the A&C Black group of imprints) will expand its offering (relatively slowly) into other sports seems like a great example of just that strategy. The database brings the reality of competition with EVERY SINGLE BOOK EVER PUBLISHED into sharp focus for publishers as new books face increased real challenges from books published 10, 20, 300 years ago and in every conceivable context, on a phone, laptop, desk computer, iPad, iPod, wi-fi enable device, anything that connects to the cloud and has a screen (not to mention an increase in POD). LitFest 10 will be held in libraries across Hertfordshire from 25th March to 27th April. The event is being run by Transworld and Random House Children’s Books and will be promoted in independents such as Maher Books and Books@Hoddesdon, as well as local Waterstone’s branches. As well as Child and Harris, other authors will include Channel 4 “TV Book Club” pick Belinda Bauer, John O’Farrell, teen authors Bali Rai and Anthony McGowan and S J Bolton. This is a very interesting move and really highlights what a well positioned publisher can do to enable connections with readers outside of any social or online media. Why wait around for Hay or any other festival to invite your authors when you can rally a fine crop of excellent crowd pleasing writers yourself? The link up with independents is also a clever strategy. I’m impressed and I hope it comes off for them. I’d expect to see more of this as publishers seek more effective ways to create audience engagement and to build lists and contacts.